Except I had a little more trouble considering I'm using a d40 with a 18-55 kit lens and a 55-200. I started with clicking the remote and taking a shot of the moon at 200mm using the paper slider. Then I covered the camera with a cardboard box and switched lenses in darkness to the 18-55 so I could shoot the harbour at 18mm for about half a minute. Another click of the remote to close the shutter and I was done. The lights of the city across the harbor gave a slight purple glow and I just tweaked the different curve levels slightly. Gave some USM and Neat Image, crop, added border, done. Wow - what an incredible shot. I had to come back to this after the challenge to see how it was done. Fascinating technique. Hats off to you & congrats for 12th place. You didn't only attempt, looks like you excelled at this technique. The shot looks great. Whoah, changing lenses! Even I've never done that before. I hope your sensor didn't get too much dust. A VERY nice result. Congrats on top 15! Great Photo. The colouring adds to the photo here (in contrast to many others, where they have just coloured a photo and the purple adds nothing). It helps set the mood here. Love the Full Moon, obviously the right time of the month for you with this challenge. Exccelent Entry. You did a good job getting two 'images' in one capture. Pretty but the color is a bit forced. Wow. I wonder how you managed with basic editing and I hope you'll tell us when the voting is over. This is a stunning shot of the moon! Gorgeous! Is that real? I can't imagine seeing this in person. Must've been stunning. Can you straighten the horizon? The moon really stands out, it looks brilliant. Interesting shot. The moon looks a little unrealistically large. The moon also looks a bit bright for the lighting in the scene, i.e. the scene would be brighter with that large of a moon. I'm wondering how you accomplished the huge moon without a double exposure or adding it in photoshop. I think you're close to a really cool shot but it isn't quite there yet in my opinion. the moon really 'pops out' the imagem its sooo big! Stunning moon and skyscape, nice one. Beautiful. I rate it 8. Beautiful capture & coloration. Love the moon! Sort of eerie! The colors on the sky and foreground are very nice. Excellent composition. Moon looks a little unnatural. The horizon is sloping to the right. Good colour though. the double exposure with dif fd again?. 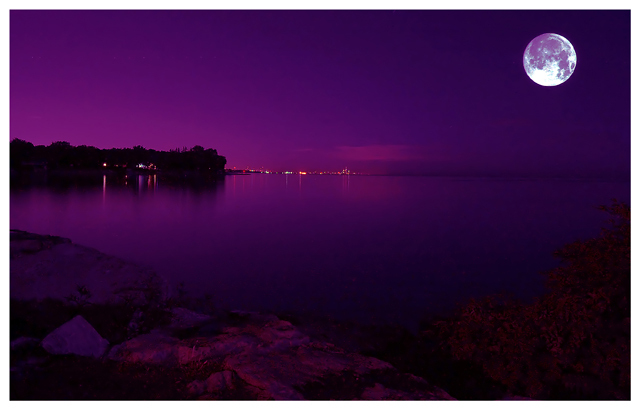 Can't remember the last time I saw purple moon! Looks like a nice place to swim. WOW -- beautiful. Love the moon! Proudly hosted by Sargasso Networks. Current Server Time: 04/20/2019 12:15:36 AM EDT.